Beautiful and durable sink. Love the way it looks! The seamless, solid core PMMA construction makes the VIGO Petunia Matte Stone Vessel Bathroom Sink extremely durable. Its surface is scratch and fade resistant and is easy to keep clean with the included buffing circle. 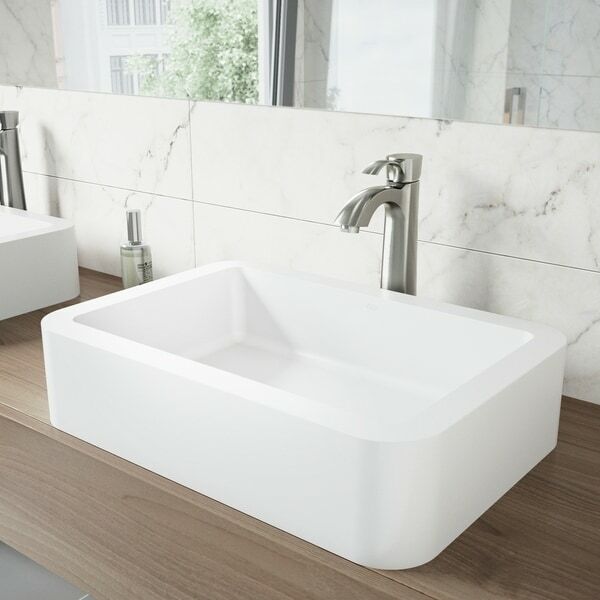 The Petunia vessel sink brings a modern, beachy feel to any bathroom in its bold rectangular shape and crisp white color. Dimensions 22.75 In. X 15.75 In. X 5.38 In. I really love this sink! We have 2. One in the guest bathroom and one in my son's bathroom. It is very sturdy. The tick rim gives it a very solid look. It looks masculine in my son's bathroom and old worldly in the guest. I love the matte look rather than having a shiny sink. I would highly recommend this sink. Beautiful sink. The finish on it is more matte-like compared to a conventional porcelain sink. It's pretty big, but fits well on our 5' vanity. This sink is a pure Snow White color. It is very solid and heavy. Have received many compliments on it. Very impress sink ! So substantial and very heavy. Looks like a very high end piece. The shipping was quick and packaged well. I highly recommend this purchase! Bought this for our outdoor kitchen, which we used a garage organizer for the cabinets. Drilled through the butcher block and metal for drain. Perfect for our needs. This item looks great, and is great! Looks great. have had a lot of wonderful comments on it. I use in my mud room and looks stylish too. Hello Michelle M., no, this does not include the drain. 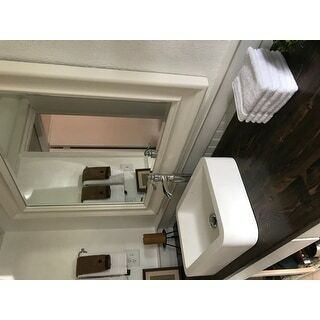 We do have a wonderful selection, if you search for "pop up drain" you'll be able to view those. Thanks for shopping with us!